Learn to efficiently shop for healthy foods. You'll notice, by the way, that many of the tips below have you looking at a food product's nutrition label and ingredients list for information. If you haven't become expert at this, time to study up. Go straight to the source -- the U.S. Food and Drug Administration -- via the Internet at www.fda.gov, put "nutrition facts" into the search line, then click on "go" for a full menu of food-labeling information. 1. Rule number one: Buy fresh food! There is no simpler, no easier, no plainer measure of the healthiness of your food than whether it comes in boxes and cans or is fresh from the farm or the fields. If more than half your groceries are prepared foods, then you need to evolve your cooking and eating habits back to the healthy side by picking up more fresh vegetables, fruits, seafood, juices, and dairy. 2. Shop the perimeter of the store. That's where all the fresh foods are. 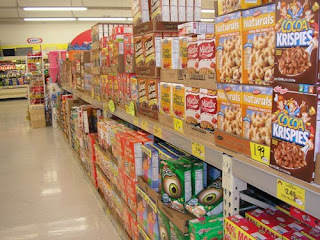 The less you find yourself in the central aisles of the grocery store, the healthier your shopping trip will be. Make it a habit -- work the perimeter of the store for the bulk of your groceries, then dip into the aisles for staples that you know you need. 3. Think of the departments (dairy, produce, meat, and so on) as separate stores within the supermarket. You wouldn't shop at every store at a mall the same way, would you? You know better than to idly browse through a jewelry store, don't you? So apply the same approach to the grocery store. Target the sections that are safe to browse through -- the produce section, primarily -- and steer clear of the dangerous sections (the candy, ice cream, and potato chip aisles). 4. Shop with a list. Organize your shopping list based on the tip above -- that is, by the sections of the store. This will have you out of the supermarket at the speed of light. If you're a woman, consider getting your husband or son to do the food shopping, says Joan Salge Blake, R.D., clinical assistant professor of nutrition at Boston University's Sargent College. The latest survey from the Food Marketing Institute shows that compared to women, men are more likely to buy only what's on the grocery list. But shopping with a list has benefits beyond speed and spending. By lashing yourself to the discipline of a well-planned shopping list, you can resist the seductive call of aisle upon aisle of junk food, thereby saving your home, your family, and yourself from an overload of empty calories. 5. Food-shop with a full stomach. We're sure you've heard this one before, but it's worth repeating. Walking through the grocery store with your tummy growling can make you vulnerable to buying anything that isn't moving, says Blake. If you can't arrange to shop shortly after a meal, be sure to eat an apple and drink a large glass of water before heading into the store. 6. Buy a few days before ripe. There's no point in trying to buy fresh vegetables and fruits for your family if the bananas turn brown and the peaches mushy two days after you get them home. Buy fruit that's still a day or two behind ripeness. It will still be hard to the touch; bananas will be green. Feel carefully for bruises on apples, check expiration dates on bagged produce, and stay away from potatoes or onions that have started to sprout. If the produce on the shelves looks a bit beyond its peak, don't walk away; ask to speak to the produce manager. Chances are, there's a fresh shipment in the back just waiting to be put out on store shelves. For a real taste treat, if you're going to eat them within the next couple of days, pick up a bunch of vine-ripened tomatoes. There's just no comparison. 7. Buy in season. Sure, it's tempting to buy strawberries in December, and once in a while that's fine. But fresh fruit and vegetables are best when purchased in season, meaning they've come from relatively close to home. They often cost less, are tastier, and have less risk of pathogens such as E. coli. 8. Buy organic whenever possible. Sure, it costs a few dollars more. But a study in the Journal of Agricultural and Food Chemistry found that organically grown fruits and vegetables contain higher levels of cancer-fighting antioxidants than conventionally produced foods. However, if organic is too pricey for you, don't worry; organic or not, fruits and veggies are key to a healthy larder. 9. Buy frozen. Frozen fruits and vegetables are often flash frozen at the source, locking in nutrients in a way fresh or canned can't compete with. Stock your freezer with bags of frozen vegetables and fruits. You can toss the veggies into soups and stews, microwave them for a side dish with dinners, or thaw them at room temperature and dip them into low-fat salad dressing for snacks. Use the fruits for desserts, smoothies, and as ice cream and yogurt toppings. 10. Stock up on canned tomato products. Here's one major exception to the "fresher is better" rule. Studies find that tomato sauces and crushed and stewed tomatoes have higher amounts of the antioxidant lycopene than fresh, because they're concentrated. Canned tomatoes are a godsend when it comes to quick dinners in the kitchen. Warm up a can with some crushed garlic for a chunky pasta sauce; pour a can over chicken breasts and simmer in the crock pot; add to stews and sauces for flavor and extra nutrients. 11. Stock up on canned beans. Although they may have a bit more sodium than we like, that's easy enough to get rid of with a good rinse in the sink. Beans can be mixed with brown rice, added to soups and stews, pureed with onions and garlic into hummus for dipping, or served over pasta for a traditional pasta e fagioli. In fact, all the hype about pasta raising blood sugar really comes down to this: What are you putting on your pasta? The soluble fiber in beans lowers blood sugar and insulin, making the combination of pasta and beans a healthful -- as well as delicious -- dish. 12. Spend some time in the condiment aisle. With the following basic ingredients you have the underpinnings for wonderful sauces, low-fat marinades, and low-salt flavorings. These delightful flavorings enable you to stay away from the less-healthy condiment items, such as mayonnaise, butter, stick margarine, creamy salad dressings, and so on: flavored ketchups and barbecue sauces (look for sugar-free varieties), horseradish, mustards, flavored vinegars, extra-virgin olive oil, jarred bruschetta and pesto sauces (luscious spooned atop salmon and baked), capers, jarred olives, sun-dried tomatoes, jarred spaghetti sauce, anchovies, roasted red peppers, Worcestershire sauce, chili sauce, hot pepper sauce, soy sauce, sesame oil, walnut oil, teriyaki sauce, jarred salsas, and various kinds of marmalades. 13. Try some of the new whole grain alternatives. Today you can find wonderful whole grain pastas and couscous, instant brown rice that cooks up in 10 minutes instead of the old 50, even whole grain crackers. Hodgson Mills makes a delicious whole wheat pasta with flaxseeds. It really tastes great, and you can scarcely do any better when it comes to nutrition. While you're at it, pick up a bag of whole wheat flour to replace the white stuff in your canister. 14. Choose prepared foods with short ingredient lists. We don't expect you to cut out prepared foods entirely. Just remember: The shorter the ingredient list, the healthier the food usually is. Of course, if the ingredients are sugar and butter, put the item back on the shelf. 15. Reject foods and drinks made with corn syrup. Corn syrup is a calorie-dense, nutritionally empty sweetener perhaps even worse than refined sugar. A shocking number of foods and drinks are thick with it, including such apparently healthy foods as fruit juices, premade spaghetti sauces, and even bread. Some experts argue that corn syrup is one of the main causes of America's obesity problem. If a food has corn syrup in its first four ingredients, then it lacks the wholesomeness and healthiness you want. 16. Look for fiber. You want at least 1 to 2 grams of fiber for every 100 calories you consume. 17. If partially hydrogenated oil, or trans fats are listed on the label, step away from the box and nobody will get hurt. 18. Pick up a jar of dried shiitake mushrooms. They may look weird, but toss them in some hot water for half an hour and you have a meaty, healthy addition to soups, stews, and sauces, not to mention a unique filling for tarts and omelets. Plus, they keep forever. 19. Whenever you find yourself reaching for a package of ground meat, switch over to the poultry section instead and pick up ground turkey, ground chicken, or soy crumbles. Works just as well as ground beef for meatballs, meat loaf, or chili. This little substitution can cut more than 30 percent of the calories and at least half of the fat and saturated fat in a three-ounce serving, says Blake. When it's smothered in a zesty tomato sauce or flavored with seasonings, you'll never be able to tell the difference. If you're feeling a little gun-shy about abandoning the beef, use half turkey and half lean beef, or half soy crumbles and half beef. 20. Choose strong cheeses. Instead of American, cheddar, or Swiss, pick up feta, fresh Parmigiano-Reggiano, or a soft goat cheese. These strongly flavored cheeses will satisfy your yen for cheese without damaging your waistline, says Blake. 21. Buy macadamia nut oil. It has more good-for-you monounsaturated fats than any other oil in the world and a higher smoke point than olive oil, so there's no trans fatty acid formation when you cook. It makes any dish you make heart-healthier, says Fred Pescatore, M.D., author of The Hamptons Diet. 22. Confirm that a wheat bread is whole wheat. Some of the folks selling bread are trying to pull the wool (or is it wheat chaff?) over your eyes. Sure, a wheat bread is made from wheat. But if the first ingredient is refined wheat flour, then it's made from the same wheat as white bread -- which means, stripped of fiber and nutrients, and in some cases, dyed brown for a fake healthy appearance. What you're really looking for are the words "whole wheat." That's the stuff with minimum refining and maximum beneficial nutrients. 23. Buy plain yogurt and flavor it at home. Pre-flavored yogurts have oodles of sugars that destroy any healthy benefits they once had. If you add a teaspoon of all-fruit jam at home, it'll still taste yummy, you'll consume far fewer useless calories, and you'll save lots of money. 24. Buy healthy add-ins for plain cereals. These include raisins, fresh berries, dried berries, almond slivers, pumpkin seeds, sesame sticks, and bananas. The best breakfast-cereal strategy is to buy unsweetened cereals and then add in your favorite flavors. That helps you bypass all the empty sugary calories -- and lets you enjoy the cereal more. For ease, keep a wide-mouth, well-sealed jar on your counter with shelf-stable ingredients for quick mix-ins. Keep a scoop and ziplock bags handy, and you've got a handy, nutritious meal or snack for home or on the go. 25. Read juice labels carefully. Orange juice, although quite healthy, often has 20 grams of sugar in the average 8-ounce glass. Instead, try guava juice. It has three times more vitamin C, and is loaded with potassium (a great blood pressure regulator) and beta-carotene.